General information: The country's first ever brewery-designed theme pub. McMullens do make great ale, the Country Bitter being an old favourite of mine, but I increasingly find the pubs they run somewhat boring and not unlike going for a pint at a hotel rather than a proper pub. The neighborhood community pubs (none left in London) are a different story except McMullens keep closing them. 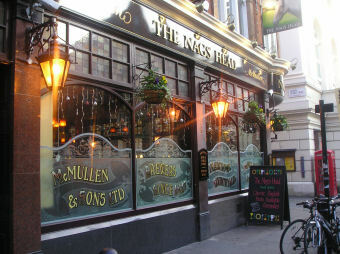 I don't bother with the Nag's Head anymore since there are several better pubs within meters away and I don't like their policy of closing several pubs elsewhere to turn them into flats. The main thing I like about this pub is that it is very big with a lot of seating so even when it is busy (and it gets very busy) you have a chance of finding a seat. It's got a nice bustling atmosphere, isn't more/less expensive than the other pubs in the area, is extremely convenient for the tube and has well kept (if limited) variety of stuff on tap. 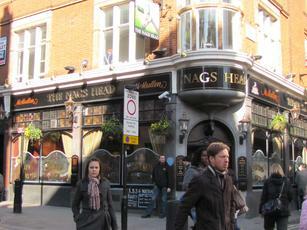 Nice looking pub with a perfect location, close to the Royal Opera House. Decent pub grub. With such a great location and all, you’d think that McMullens should be able to come up with something more exciting than their standard range of pedestrian ales. Alas ... Still worth visiting if you need the ticks. For the more discerning pub-goer, and certainly ale-drinker, the Nags Head cannot compete with some of its more worthy nearby neighbours, and is highly unlikely to be a 'destination' venue for this kind of customer. Saying that, it is also not a place which I imagine punters of any taste and preference would actively seek to avoid, as besides its obvious convenience of location bang in central Covent Garden, it does offer some redeeming if not exactly alluring features. The building which houses the pub is charming, set in one of the nicely-preserved terraces which happily one still finds frequently in the neighbouring streets. The interior has seemingly been lovingly maintained by McMullen's brewery, and it is what one would hope for upon arrival - clean, traditional, comfortable, and suitably spacious for a pub which regardless of its perceived merits is bound to attract a vast number of passers-by eager for a drink and possibly a meal. The atmosphere is not entirely moribund, if only because it is nearly always heavily-populated by the kind of mixed clientele that characterises modern CG - male, female, old, young, local, tourist, employed, jobless - you name it, you're likely to find a broad sweep in an average 24-hour period here. 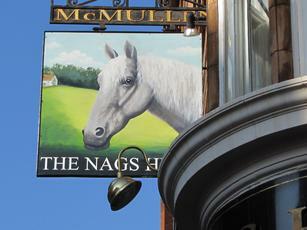 Nevertheless, arguably the Nags is a little too mixed, to the extent that it lacks any obvious discernable identity. Its hard to see it as anyone's hard and fact 'local' and so in that regard there is a passive, transient feel about it. Beer-wise, the usual raft of tapped and gassed products are available from what I recall, and only a limited number of cask offerings on pump. Being a McMullen's house - a rare thing even though it's only a county further south of its heartland - the ales featured are from their portfolio, which is somewhat restrained and very traditional. Notwithstanding this, the regulars - AK and Country Bitter - aren't bad, and for the less-demanding palate they represent pretty sessionable options. 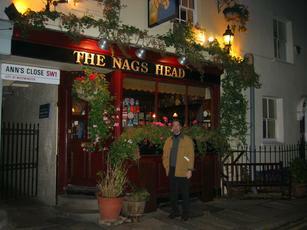 The visits I've made to the Nags suggest they're usually well-kept here, though inevitably overpriced. Food remains a mystery to me as I've yet to have cause to sample any - not because I've heard any adverse rumours of its quality but simply because the options in the area restaurant-wise usually tempt me in if I need sustenance, even if I have a drink in a pub before or after (popped into nearby Maxwells last Friday for example). So I can't say any more about the grub offered here. I do just hope it eschews the all-too-prevalent "high-price, indifferent quality" formula that so many CG outlets get away with. 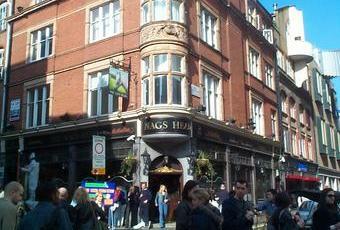 All in all, an average but consistent boozer in a vibrant and bustling district. If you just want a quick pie or pint then it may do you, but the fussier and more adventurous the person, the greater the reward of walking on to a more rarefied venue.